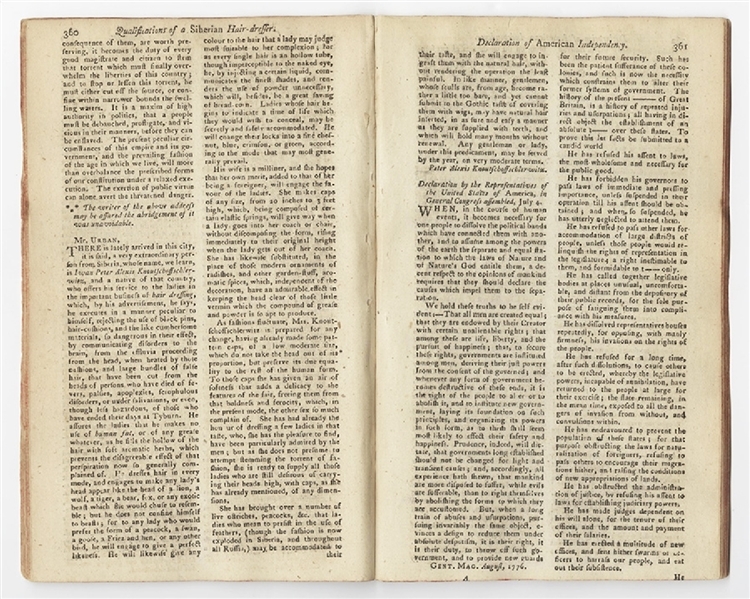 First edition of Gentleman’s Magazine for August 1776, 32pp., disbound, printed in London, featuring an early printing of the Declaration of Independence on page 361 and 362, “Declaration of the United States of America, in General Congress Assembled, July 4....”. Signed in type by John Hancock and Charles Thompson. 5" x 8.25". Tastefully rebound; with the illustrated title page, but lacking the plate of Chepstow Castle, minimal wear; publishers red stain applied to outer page block. London, August 1776. The Declaration is also discussed in a later article in this August issue titled "Account of the Proceedings of the American Colonists": "Whether those grievances were real or imaginary, or whether they did or did not deserve a parliamentary enquiry, we will not presume to decide. The ball is now struck, and time only can shew where it will rest" (page 377).